Two rear wheels rotate 360 degrees, creating a tight turning radius. 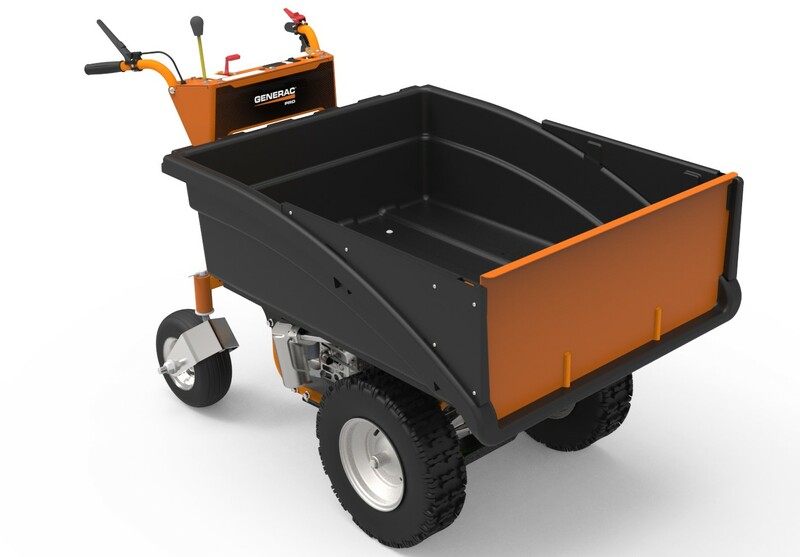 Push the Powerwagon through gateways, barn doors, into wooded areas, or narrow hills, and more! 60 degree dump angle empties the bed thoroughly at the push of a button. A hand-actuated disk brake checks the speed of a fully loaded cargo bed when operating slopes. Lockable brakes secure the machine in place for loading an unloading. ​8.0 ft-lbs Generac G-Force Engine- Durable and powerful. Wide Load Bed- Large one-piece molded bed allows for up to 800 pounds of material. Disk Brake- A hand-actuated disk brake checks the speed of a fully loaded cargo bed when operating slope. Lockable brakes secure the machine in place for loading and unloading.